It's getting warmer and we decided to celebrate the next Songversations I BLN with a very special edition. We'll start at 8PM with an easy sundowner warmup in our backyard. Join us for fresh drinks and spring tunes before we slide into the late night edition. Dope vibes and a bunch of amazing people guaranteed!!! We're more than happy to announce our dear friends, great musicians and power couple Jen Dale & Stimulus for this very special date! As a Soul singer and songwriter Jen Dale's music is influenced by great legends ranging from Marvin Gaye and Ella Fitzgerald to Dire Straights and Jimi Hendrix as well as from her travels throughout Europe, Africa, India and the Caribbean. “My lyrics are just my interpretation of the way I feel about everyday things like dreams, controversy, the World, love, him, her and me. I love the little things." Jen is currently working on her new album set to be released this year. 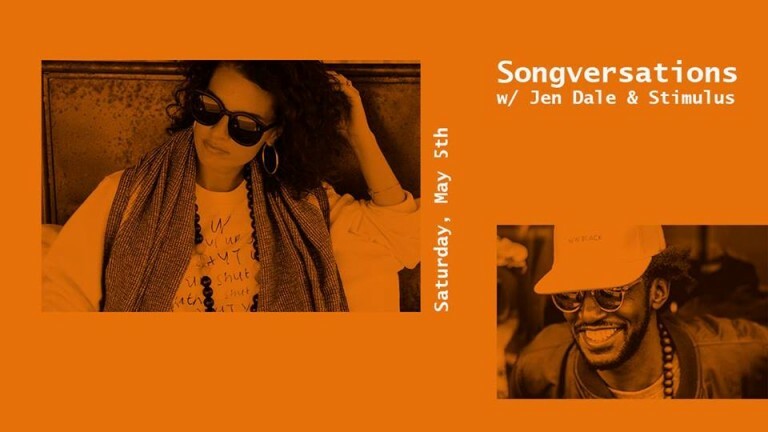 We're looking forward to songversating with Jen and getting a sneak preview of her upcoming album! After the performance by Jen and her live band, Stimulus will blow your top off with some hot Soul & RnB beats! We're especially excited to have Andrea Rosen back long enough for this one!! When she's not shutting it down in DJ booths across Milan, Tel Aviv, Barcelona or Berlin, she’s gallivanting the Globe making moves in the Tech World. They don’t come as multi-faceted as this particular DJane and we are so glad she’s around long enough for our next edition on the 5th of May!